Design for a chimneypiece showing a small central pediment above a head of Apollo in relief with herms on either side. The chimneypiece is shown in elevation, section and plan. 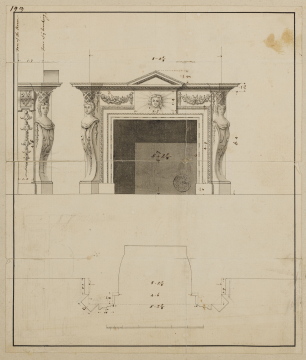 You are here: CollectionsOnline / Design for a chimneypiece showing a small central pediment above a head of Apollo in relief with herms on either side. The chimneypiece is shown in elevation, section and plan. In the opinion of A. A. Tait, this drawing relates in time and place or subject to those contained in Adam volume 7.This is a copy of a design found in Isaac Ware, Designs of Inigo Jones and others (London, 1731, pl.36). In making his copy, the draughtsman has eliminated the overmantle, and the composition is similar to that in plate 22, the design to which John Adam referred in his Memorandum for furnishing the Great Bedchamber at his father's Hopetoun House in 1755: 'Ware page 22 is thought will do well for this room: and the Apollo's head will answer for the blocks in the frieze ...' (J. Fleming, Robert Adam and His Circle in Edinburgh & Rome, London, 1962, p.92). The present State Bedroom was reconstructed as a dining room in c.1820, but a chimneypiece in the present hall is very close to that in plate 22 of John Vardy, Some Designs of Mr Inigo Jones and Mr William Kent, 1744 (for Vardy drawings, see R. White, 'John Vardy', in The Architectural Outsiders, London, 1985, pp.63-81).